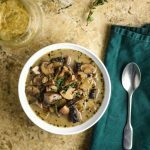 This vegan cream of mushroom soup recipe is hearty, delicious, and easy to make. A perfect fall and winter warmer soup. Add the olive oil to a tall soup pot or dutch oven over medium heat. You need a large pot for this recipe as the mushrooms will initially take up significant space. When oil is warm, add the onion, salt, garlic, dried oregano, basil. Cook for 3-5 minutes, stirring frequently. Add the sliced mushrooms and soy sauce and cover the pot. Cook on medium high, covered, for around 10 minutes. I stirred 2-3 times during this part. The mushrooms will release their water which will form the base of the soup. Remove the lid, and cook uncovered for an additional 10 minutes. Add the coconut milk and cook for a final 10 minutes, stirring occasionally. In total, you will cook the soup for 30 minutes, in three 10 minute sections. Add sea salt and black pepper to taste. I added another teaspoon of salt to bring out the flavors. Garnish with fresh herbs and serve. Pairs well with wine and a piece of bread. Store in covered container in refrigerator for up to 3 days. *Recipe is a guide. Adapt as desired. Adapted from Lovin It Vegan.